A whole city transformed, how is that even possible? What difference can you and me actually make? Hopelessness, injustice and suffering, is there even any chance for change? Yes! It’s you and me! We are the answer, we carry the hope and we do have the life. JESUS! The time to demonstrate God and His powerful love to a lost world is now. One by one. Are you ready? Come, join me, I’ll take you on a journey. Maybe the next journey will become your own story by becoming part of the Revival School!?! 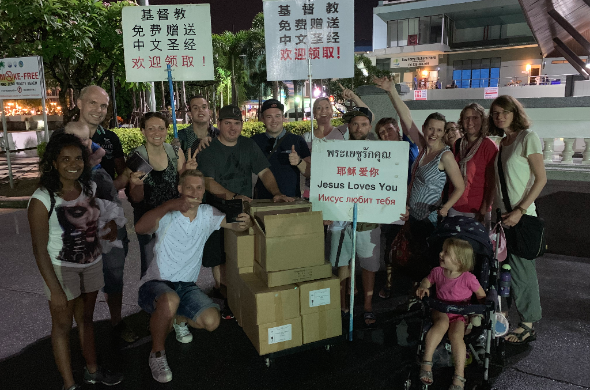 A team of our students and staff of the fellowship in Luedenscheid went for ten days to Pattaya City. Simon, a graduate of the school of last year carries the vision to establish a branch of our ministry there and is living currently in Bangkok. Together with him and the leaders of HELP International Thailand we went into one of the biggest red-light districts in the world. It’s encouraging to see how many devoted christians live there already and how much they emphasis on their unity. Wherever we went we were welcomed so kindly and became a small part of the ongoing transformation. There is the Tamar Center, where people minister to bar-girls and prostitutes, or the recent `Shine Pattaya` gospel-event with more than 4000 participants. There is the American, whose ministry is distributing Chinese Bibles to the countless tourists coming to town. There also is a church, where members immediately take care of a homeless ex-Muslim, whom we took to their service and who say: „Don’t worry, we will take care of him!“ There is a story about that man: The day we did a March for Jesus passing through the notorious ‘Walking Street’ in Pattaya, we walked and danced, worshipped Jesus and preached the Gospel. And there we met Hamit, who lives on the street since two months. The night before he dreamt about people approaching him and share about God Jesus to him. That day we showed up and he gave his life to Jesus. Two Muslims walked by and tried to give him a warning but he just replied: „I don’t care what they say, I am a Christian now.“ A few minutes after praying the sinners prayer Hamit received the Holy Spirit and started praying in new tongues. Soon he wanted to be baptised. 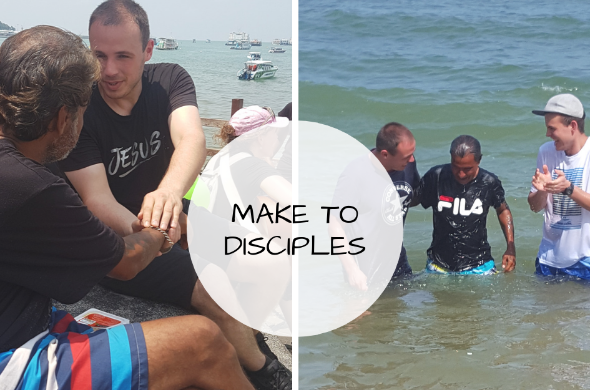 After meeting with him several times to talk and pray together we baptised him in the sea. Another two days later we could connect him to the local church. The combination of prayer, worship and evangelism bears a unique power. That’s what we experience while doing outreaches. One man was delivered of demons and he also gave his life to Jesus afterwards. Talking to a woman we had three words of knowledge about her body-parts which were hurting and when she got up of her chair she was healed completely and then received Jesus, too. We did several outreaches of this kind and in total 17 people we met surrendered their lives to Jesus and even more were healed in His name. We worshipped over the city prophetically and lifted the name of Jesus high. We had a powerful unity in our team because sharing the same vision strengthened us even more. It’s great to go into a city, where faithful Christians invested sweat, blood and tears while laying down theirs lives and who - no matter the circumstances - are holding on to the vision God gave them: To transform a whole city by the love of the Father - the greatest power of the universe!